Buffelsfontein Lodge & Inyati Spa: The lodge is set in the majestic Bosberg Mountains of the Eastern Cape and is only 200 km from Port Elizabeth and 15 km from Somerset East. Breathe the clean mountain air in a peaceful malaria-free environment. Buffelsfontein Lodge offers you stylish, comfortable and affordable accommodation with all the modern facilities and a homely, personal touch. At the lodge we have fully equipped braai facilities and a fully equipped kitchen. 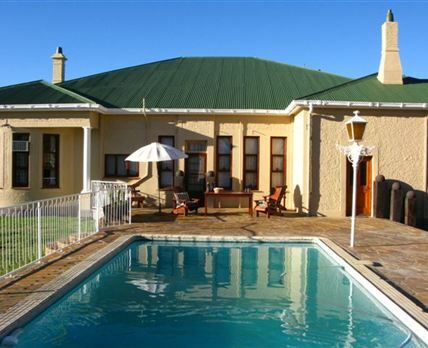 All bedding and towels are provided and we have a lovely sparkling swimming pool and a lapa with magnificent views. The spa offers a tranquil setting for relaxation where a world-class therapist is on hand to pamper and revitalize guests with a comprehensive range of massages and health and beauty treatments. Facilities include a restroom, a massage and therapy room, a steam room, a sauna, a Jacuzzi, a shower, an Ozone Pod and Swiss showers. The lodge also has exquisite cuisine with varied menus that include local game and fine wines. Click here to enquire at Buffelsfontein Lodge & Inyati Spa.